about currency exchange, weather, and time conversions. These topics are often overlooked! The euro is the single currency currently shared by 18 of the European Union's Member States, making up the euro area. Austria, Belgium, Cyprus, Estonia, Finland, France, Germany, Greece, Ireland, Italy, Latvia, Luxembourg, Malta, Netherlands, Portugal, Slovakia, Slovenia and Spain. The Visa global ATM network operates one million machines in 160 countries. 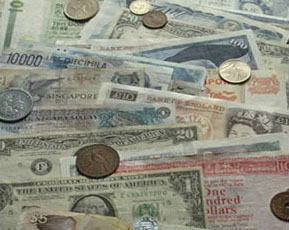 A multilingual currency converter for over 164 currencies and 3 metals. Send a money transfer online around the world or transfer money to a bank account or for cash pickup. Shows current time and date in cities and countries in all time zones, automatically adjusted for local Daylight Saving Time rules. Time and time zone converter. Readily tell the time anywhere in the world using a frequently updated time zone database. Provides local, national and global weather conditions and forecasts, radar, satellite, interactive weather maps, severe weather alerts and weather reports. Provides weather, water, and climate data, forecasts and warnings for the protection of life and property and enhancement of the national economy. Gathers a worldwide range of climate data in an easy-to-use form. Climate data are historical weather averages, showing what the weather was typically like each month, averaged over a range of years. On behalf of its fifteen member states ESO is the foremost intergovernmental astronomy organization in Europe and the world's most productive astronomical observatory.